The first marketplaces date back to the mid-1500s. Brokers, moneylenders, and citizens would go to a specific physical location — often a city square or centrally known area — to buy or sell goods and deal with business, government, and individual debt issues. Over time, exchanges evolved into a concept similar to what we know today. One of the first futures and options exchanges began in Chicago in 1884. The traders stood on the octogon-shaped floor and made trades in the pits by negotiating buys and sells. The bids were placed in local currency (U.S. Dollars), and while the trading was peer-to-peer, the clearing of the trade was handled by the exchange. Eventually, advances in computing made it possible for orders to be stored in a single source of “truth,” famously named an “order book.” An order book is a list of the bids and offers in a given asset, organized and matched according to a specific algorithm. Currently, order books are both physically and logically centralized. They are physically centralized because they run on a single server, and they are logically centralized because all messages are processed synchronously. Today, assets trade through centralized exchanges with trusted centralized parties conducting the transactions. The exchange must be in a physical location and jurisdiction, and both parties in the transaction must be in the local jurisdiction — foreign parties are not allowed to buy or sell. Orders are handled first-in-first-out, and every participant in the market is subject to the same algorithm treatment with respect to order execution. Lawyers, bankers, brokers, clearinghouses, and governments are all part of the trading equation. But do they need to be? A new paradigm of transaction execution called blockchain could eliminate the need for all of these middlemen. In a blockchain, transactions are verified by distributed nodes, and anyone can join or leave the network as they please without disrupting the network’s ability to form consensus on transactions. Instead of using a single computer to manage transactions, like we do now, we could leverage a global computer. Bitcoin was the first example of a blockchain being used to communicate value globally, with trust and without middlemen, and Ethereum extends the power of the blockchain. The Ethereum platform runs smart contracts, applications that run exactly as programmed without any possibility of downtime, censorship, fraud, or third-party interference. It allows for decentralization to take hold in a much more meaningful way, as Ethereum users can exchange anything atomically and, most importantly, with trust. Ethereum tokens are an implementation of a smart contract. They are accessible globally, and a token’s market can flourish without a middleman. Already, they have dramatically changed how software projects are funded by replacing the traditional venture capital/angel investor model. Instead of individuals having to go through these investors to get their projects funded, they can sell tokens directly to the public. With a simple text string and the click of two buttons, users can participate in these new business models from anywhere in the world. People have the opportunity to invest in the protocol and not the company directly, and this new way to create and finance business models has been a runaway success. In addition to removing the need for middlemen, blockchain technology enables us to build decentralized exchanges. Decentralized exchanges are global, borderless, frictionless, private, and secure. They allow users to exchange assets without the interference of a central party or jurisdiction. This is significant because central parties and localization impose a major financial burden on the current system. With blockchain technology, an exchange mechanism can be codified into the blockchain directly. This new kind of “order book” does not need to be physically centralized because the servers forming consensus are distributed, and no single server has definitive power over the other servers. Exchanges do not need to be logically centralized since the code is open-source and free for anyone to audit. Decentralized exchanges can communicate across borders. They’re not located in one specific location like Hong Kong or New York because they live on the global network, the blockchain. For example, users in Kuala Lumpur can trade directly with users in Berlin or Chicago, while their assets remain local and free of unnecessary intermediaries. By allowing value to be communicated globally and without middlemen, decentralized exchanges will have the same disruptive power that tokens have had over VCs. Instead of a trader going through a centralized exchange to reach another trader, they can trade directly with one another through a decentralized exchange. The traders can be located anywhere and can trade with anyone in the world, without any intermediaries involved. A globally accessible exchange, without intermediaries, provides new access and liquidity to assets. The global, frictionless nature of these new blockchain-based exchange models will propel them to succeed at the same scale that tokens have succeeded. The current exchange system is antiquated and burdened by unnecessary costs. Decentralized exchanges are a foundational piece required to break apart the current system, and once we do, we’ll be able to communicate value without borders. Far more assets will be digitized and traded on decentralized exchanges than could have ever been traded on centralized exchanges. Middlemen will be removed, trust will be maintained, and value will be transacted globally. Michael Oved, C0-Founder of Airswap, is passionate about a future where people fearlessly trade digital value without third-party intervention. 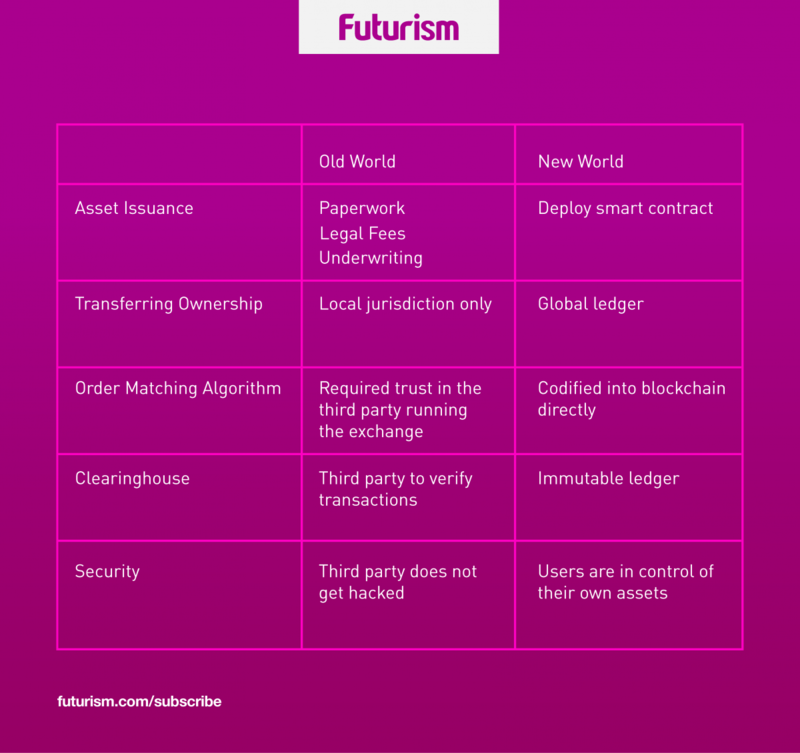 Disclosure: This content is labeled sponsored because Futurism is exploring a financial relationship with Swap. Several members of the Futurism team, including the editors of this piece, are personal investors in a number of cryptocurrency markets. Their personal investment perspectives have no impact on editorial content.